The Customer Service Week celebration at CMA CGM (America) combined fun and education in an ambitious five full days of festivities. The week started with a Star Wars theme. When employees arrived at work, they were transported to the future. The elevator whisked them skyward to the sounds of a spaceship lifting off. 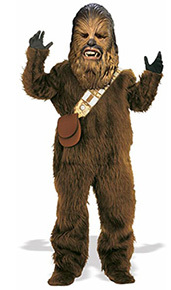 They were also accompanied by an actor dressed as Chewbacca, the wookie warrior. The building was filled with space ship decor and the lunchroom was converted to the raucous Star Wars Cantina. The company’s out of this world celebration also included many down to earth activities that would make a wonderful addition to virtually any Customer Service Week event. Dress Up. A daily theme gave everyone the opportunity to dress up and take photos. "Selfie-stations" were located on each floor and a photo booth was in the lobby. Learn. Guided tours gave employees an opportunity to visit many departments and learn about the work of all 600 plus employees at the company’s headquarters. Lunch and learn events featured speakers from within the company and outside guests. Play. Teams from many departments participated in daily rounds of Family Feud. Those who did not play were encouraged to support their teams. In addition there were daily opportunities to play Taboo and Name that Tune, and to participate in relay races. All winners received tickets for a prize drawing. 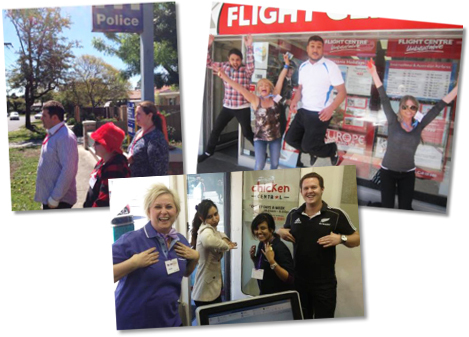 During Customer Service Week 2014, Pioneer Investments took three classic Customer Service Week activities and added some contemporary twists. Youre sure to want to save these great ideas for your next celebration. Morph Contest. The popular matching contest in which participants must match a baby photo, smile, or pet with its owner was updated to the Morph Contest. Reps were photographed and then every two photos was morphed into one. The photos were distributed via email and everyone tried to guess which two people made up each photo. Selfie Scavenger Hunt. The traditional scavenger hunt, in which teams or individuals travel through the organization following clues and collecting items, was updated to a Selfie Scavenger Hunt. As each item was found, a selfie was snapped and later shared with the group. Power Point Compliments Board. No more poster board for this team, the classic Compliments Board was re-imagined as a PowerPoint presentation that was played during a staff meeting. Help Me Choose celebrated Customer Service Week with five full days of team-oriented activities, festive decorations, and delicious treats. Communications Manager, Sarah Cannata blogged about the event and posted to Facebook and Twitter so that employees and customers could share in the celebration. Here are highlights of some of the many activities. Theres even a video with more highlights and more ideas. Monday: Blow it up. The service crew competed to see who could blow the largest bubble-gum bubble. Tuesday: Piece it together. One of the Customer Service Week mini-posters was mounted on foam board, then cut into puzzle pieces. Teams had five minutes to reassemble the mini-poster. Wednesday: Who am I? Each person shared five facts about themself, including who their doppelganger is. Later in the week, team members received a list of the facts and tried to match them to their teammates. Thursday: Cups and Cards. This activity saw teams working together to build the tallest stack of cups and the most impressive house of cards. Friday: Get the party started. To celebrate the last day of the week, teams of two worked to move a balloon to the accompaniment of the song Get the Party Started. Maybe you better see the video for this one. 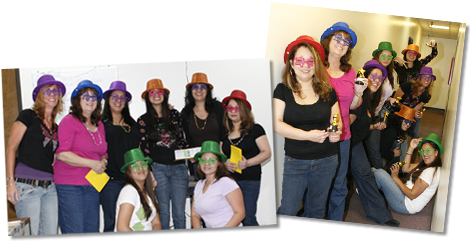 At Advanced Drainage Systems, the 19 person service department celebrated with a carnival theme. 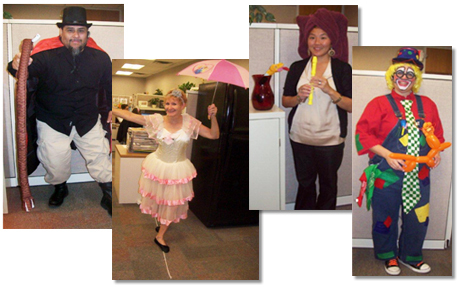 Team members dressed as a snake charmer, tightrope walker, ring master, and more. They celebrated with traditional carnival foods and games. But rather than awarding prizes for each game, the winners earned points. Then on the final day of the celebration everyone gathered to spend their points selecting their prizes. Many Customer Service Week celebrations tie-in with seasonal events such as the fall harvest, Halloween, or breast cancer awareness month. 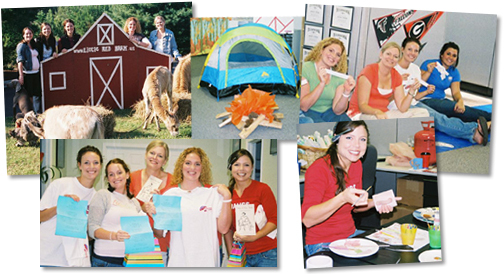 In Winston-Salem, NC, the celebration at Aon Hewitt tied-in with the local county fair, which takes place at the same time. The festive mood began as reps arrived on Monday morning and were greeted by their managers with music, balloons, and raffle tickets. The winner of the raffle drawing received tickets to the Dixie Classic Fair. The fair theme continued each afternoon as managers distributed snacks including candy apples, cotton candy, and snow cones. 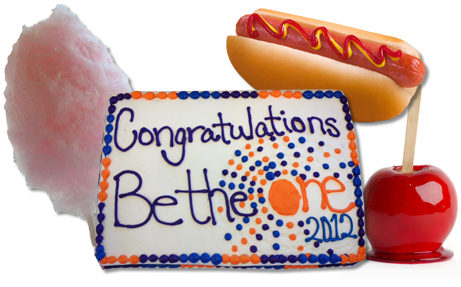 And a classic hot dog lunch, complete with Customer Service Week cake, wrapped up the week. Games and activities also had a fair theme. Reps tried their hands at ring toss, corn toss, a duck pond, and Wii games. There was also a little good-natured competition between Aon Hewitt service centers in different parts of the country, to see who could collect the most toys for donation to local childrens centers. 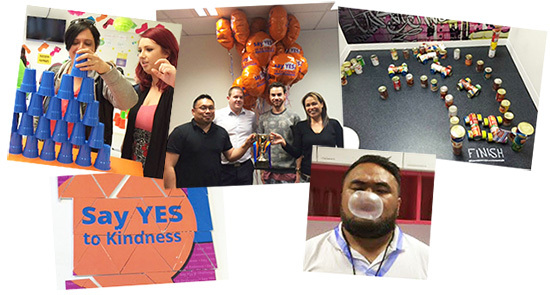 The team at HelpMeChoose.com.au in Melbourne, Australia hosted a Customer Service Week celebration that was packed with fun activities. And with careful planning and forethought, the activities also included many important lessons on teamwork, service excellence, communication skills, and more. Kick-off brunch. The week started with a kick-off brunch, which was attended by the company CEO. It was also the time for reps to form teams for group activities. To help everyone in the service center get to know each other, they were randomly assigned to teams. To do this, each beverage glass had a different colored ribbon tied around the stem. When reps grabbed a glass, they were randomly choosing their team. Each rep then received a matching lanyard and name tag to help everyone get acquainted. Training day. The national training and development manager for HelpMeChoose.com.au traveled roughly 900 miles to give a presentation on Customer Service Excellence. This was also a dress up day, so a fire fighter, waitress, and others were in attendance. Amazing race. Next came a fun twist on the television program Amazing Race. Local shops got involved handing out clues and acting as sites for different activities. Teams took photographs, or in this case mug shots, outside the police station, photographed themselves dancing like chickens outside a popular lunch spot, and more. Office Olympics.The underground garage was transformed for the teams Office Olympics. Chair races are always popular activities but the team added a vivid example of the importance of accurate communication. 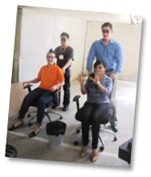 One team member pushed the office chair while blindfolded. Another team member sat in the chair guiding the driver through an obstacle course. Closing ceremony. Finally, Friday brought a barbecue lunch and closing ceremony. The highlight of the event was a presentation on the results of the companies first annual customer satisfaction survey. But certainly the highlight has to be the Closing Lunch Soiree. A theme is chosen and appropriate decorations and food are provided. At the event, each rep receives an award and Carol gives a carefully prepared speech. In it she talks about the accomplishments of the department and weaves in an anecdote about each reps success during the year. She even includes a quote from at least one customer and one outside sales rep.
Monday. Kick-off breakfast, introducing the Customer Service Week theme, schedule of events, goals for the week, and a presentation from the senior vice president of global sales and marketing. Tuesday. Seminar on time management, plus a fun afternoon playing Minute to Win It. Wednesday. Presentation on the service teams activities, plus announcement of the customer service rep of the year, and a rousing game of Deal or No Deal. Thursday. Donuts and small stress relievers are delivered to other departments. Pizza lunch with company trivia contest. The Customer Service Week celebration at the Gansevoort Miami Beach Hotel featured three things we love in a celebration: Great food, recognition for all, and a spectacular wrap up. The week started with a special welcome for the morning team at 7:30 a.m. Team members were ushered through a balloon runway, past cheering executives, to a breakfast buffet. When the afternoon team arrived at 3:00 p.m. they were greeted with cheers and applause along the runway to a cookie and mocktail reception. Then on Wednesday, the overnight crew was saluted with a full breakfast with white tablecloth service as cheers and bubbles filled the air. The week wrapped up with a carnival including games ranging from pin the nose on the general manager to, bean toss, to office chair races. Cotton candy, balloon animals, and raffles rounded out the afternoon event. The team at Federated Investors, Inc. took this years theme Refresh * Reconnect * Recharge and adapted it to a 5-day cruise-styled celebration. The week got underway with a kick off Bon Voyage Breakfast. The Sansom Auditorium was transformed into the cruise ships Lido Deck. Breakfast was served and the head of sales discussed the importance of excellent customer service. Throughout the week daily events and activities supported the cruise theme. Staff members dressed in resort casual, visited popular ports of call such as the popcorn bar, had their photos taken with the captain, and even made ship-to-shore deliveries of cakes to business units that support the service team. To view the complete itinerary for the 5-day cruise click here. Dont miss all of the clever touches such as the ships name, welcome from the hospitality team, and website set up just for this event. Youve seen the Cake Challenges on TV — Master bakers pitted against each other to create the most beautiful and over-the-top creations. So when you host a cake and coffee break, or need an fresh idea for a team challenge, why not think cake? For a cake decorating contest at CBK Mountain Adventures, the staff was divided into teams of two. Each team received a sheet cake, and an assortment of frostings. The challenged was to create a theme cake for the week. And at Axis New England the cake is the highlight of the celebration, with a professional baker creating a masterpiece each year. The team at Federated Investors got creative when they combined the Customer Service Week theme A Tradition of Service, with an Academy Awards theme. The result was The Federated Oscars: A Tradition of Service, which celebrated the companys 55-year tradition of Oscar-winning service. Red Carpet Kick-Off Breakfast. Senior managers greeted arriving employees in the lobby where they enjoyed breakfast and an opportunity to have a photo taken with a life size Oscar statuette. Reel Deal Trivia Contest. Daily emails asked questions about the companys history and about corresponding milestones in Hollywood. Award Programs. Instead of paper progams, a PowerPoint presentation featured each of the service teams and was shown on several large screen TVs in the lobby. The presentation was also featured at a wrap-up luncheon on Friday. SWAG Bags. No awards ceremony would be complete without goody bags. Federated Investors bags included a top hat, candy and a personal note from the team manager. Throughout the week, the team at the Health Plan of the Upper Ohio Valley enjoyed games, movies, popcorn, prizes, and more. But the one event that really brought out everyones creativity was a decorating contest with a holiday theme. Teams of reps decorated their cubicles for Thanksgiving, Christmas, Easter and other holidays. Some even dressed in costume to compliment the theme. 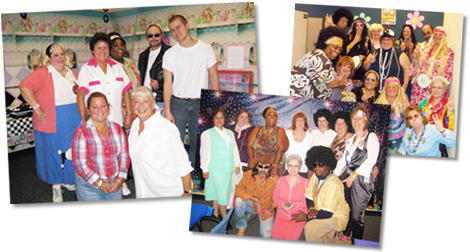 The team at Black & Decker/End User Services embraced the 2010 Customer Service Week theme, A Tradition of Service, by celebrating a different decade each day — 1950 through 1990. Starting the day with Dunkin Donuts (introduced in 1950). Enjoying lunch in a classic soda shop, actually a fully decorated meeting room. The menu included hot dogs, Ruffles potato chips (1958), and ice cream sodas. Playing decade appropriate games such as throwing a Frisbee (1958) into a hula hoop (1958) to win silly putty (1950), Bazooka Bubble Gum (1953), and more. Many celebrations feature a different theme each day. But, not at CSC where the patriotic theme was big enough to last the full week. The building contest. A creative twist on this popular Customer Service Week activity had team members working together to build U.S. monuments from spaghetti and marshmallows. The winner at over four feet tall was the Washington Monument. Photo tribute. Each location also created a photo tribute to honor friends and family serving in the military both at home and abroad. Rep of the Year. And finally, the customer service rep of the year was announced. Communications Manager, Jane Leahy tells us that, This years winner maintained a perfect attendance record and is an excellent role model and leader for the team. The winner received a $250 gift certificate, a plaque and was featured in an article in the company newsletter — Thats a great way to spread the word about the excellent work done in the service center. 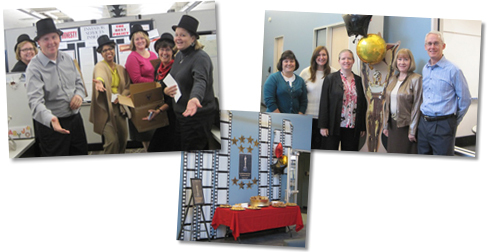 To celebrate Customer Service Week, Systems Services of America created a week filled with movie trivia and an Oscar-style party where every CSR was a star. Weeks before the celebration, service manager Dianna Bailey-Thompson asked each rep on her team to write something special about every other person in the department. All of the comments were then combined into a You Are The Star booklet. For the Oscar party, reps dressed in sparkle top hats and star shaped glasses and lined the red carpet to wait for the stars. Dianna called each reps name and read the compliments she had received while the rep walked, or danced, down the red carpet past cheering coworkers who blew horns and tossed confetti. Dianna tells us that it was a great way for the CSRs to celebrate each other as well as themselves and it was a huge success! As a momento of the celebration each rep received a copy of the star booklet and an award for her desk. 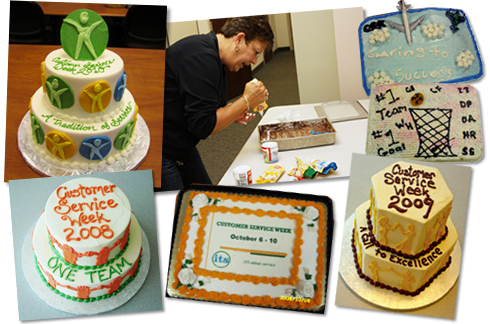 The service team at United Stationers Supply Co. has been celebrating Customer Service Week for several years. This years event featured the return of their popular prize wheel, known as the Wheel O Fun, plus many creative new ideas. Each morning members of the leadership team greeted associates at the door. Theme days, puzzles and activities, and a special breakfast or lunch each day rounded out the week. But the activity that really caught our attention was called Pimp Your Ride. The activity is loosely based on the TV program, Pimp my Ride. In each episode a dilapidated car is restored and customized in an over the top effort to reflect the owners personality and interests. In this office edition, associates were asked to customize their own rides. Otherwise known as their desk chairs. It was all part of the awesome week at United Stationers Supply Co.
Carolyn Reynolds describes her celebration as, "Customer Service Week on a dime." But there was no skimping when it came to planning a week full of activities, beautiful decorations, and thoughtful gifts. And best of all, it provided the Metro Government of Nashville and Davidson County Information Technology Services Technical Support Center "a much needed opportunity to thank our internal and external customers, and, for the department leaders to recognize our Service Desk Analysts for the terrific job they do." Team members kicked off the week by signing the Customer Service Week pledge and recommitting themselves to their service mission. Throughout the week staff acknowledged the great service, follow-up, phone etiquette, and teamwork of their colleagues with Caught in the Act Cards. On game day, there was something for everyone as team members participated in basketball, pool, Mad Gab, and checkers tournaments throughout the day. A stress-relief break, featured ice cream sundaes and stress-relief goodie bags. Throughout the week, coins were awarded both for participation and for winning events. These coins were very important because the team member with the most coins received a grand prize and all others were entered in a prize drawing. The order of the draw was based on the number of coins awarded. 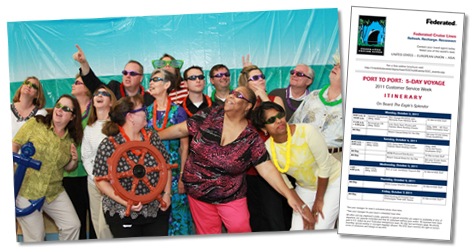 A new Customer Service Week activity at Martin Group is bound to become an annual favorite. Involving reps, other departments and a creative expression of the companys commitment to service, its just what Customer Service Week is all about. To share their service spirit with the entire company, the Customer Care Support Team created a chair parade during Customer Service Week. The group was randomly divided into teams of four. 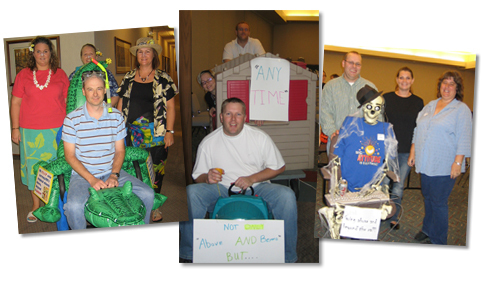 The teams were asked to create an Office Chair Float, which represented their commitment to excellent customer service. A total of seven floats joined the parade traveling through the building tossing candy, Mardi Gras style, to laughing spectators who lined the hallways. The week began with associates traveling to the MBCI (Masterbrand Cabinets, Inc.) Airport where they were greeted by supervisors who handed out passports, itineraries and salty snacks for the journey. Each day, associates returned to the airport where they boarded a Unite All Airlines flight to their destination. They received a goodie bag with items for their trip, enjoyed a lunch of regional specialties, and played travel and location themed games. Monday — Flight to Mexico. Each associate received a goodie bag containing a stress relief tangle, Mexican jumping beans and candy. Lunch included tacos, chips and salsa. And the games included pin the flag on Mexico, ring toss in which rings were tossed onto a cactus, a memory game in which associates were shown travel-sized items for 15 seconds and asked to recall as many items as possible. Tuesday — Flight to Hawaii. As associates arrived at the airport, they were greeted with a traditional Hawaiian lei and a goodie bag filled with candy, sea shells, and a bottle of bubbles. Lunch featured Hawaiian pork sandwiches. While games included pin the flag on Hawaii, a timed hula hoop contest, and a golf putting challenge. Wednesday — Flight to China. At the airport, associates received Chinese take-out boxes filled with goodies such as chop sticks, a compass, and candy. Lunch included egg rolls and various lo mein dishes. And the games featured ping-pong, a suitcase packing game, and a timed game that involved putting various objects into a take-out container box using chopsticks. Thursday — Flight to France. 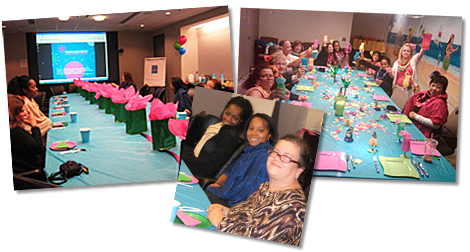 Each associate received candy and a stress-relief toy for the journey. They enjoyed a lunch of croissant sandwiches and non-alcoholic Champaign punch. The days games included a French history quiz, pin the flag on France, and a painting contest. Friday — Flight to New York. To wrap up the week, associates visited the Big Apple. At the airport they received a top hat filled with candy and a stress-relief ball shaped like an apple. The days meal included New York-style pizza and cheese cake. Games of tacky tourist, pin the flag on New York, and an adaptation of the television show Cash Cab rounded out the celebration. While some organizations celebrate Customer Service Week with a host of events and activities each day, others choose to make a big impression with a single special event. The team at PSA, celebrated for just one day during Customer Service Week but their special event and the element of surprise made the day a huge success. For months, director Jackie Ready had been telling reps that they would be celebrating with a cookout in a local park. 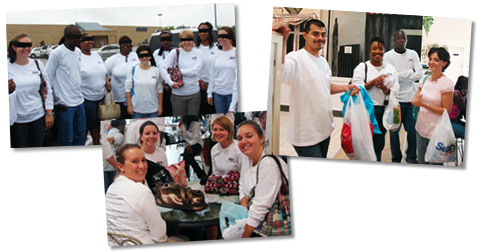 But when the big day arrived reps were blindfolded and driven to a secret location — the mall. Once there, reps received gifts cards and spent the afternoon shopping and enjoying a relaxed lunch with their colleagues. 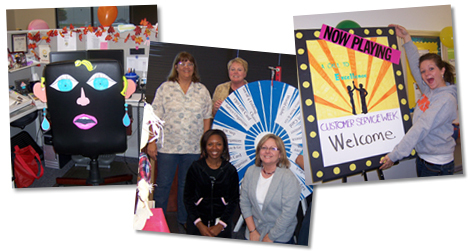 A great deal of thought and planning went into the Customer Service Week celebration at Estep Enterprises. 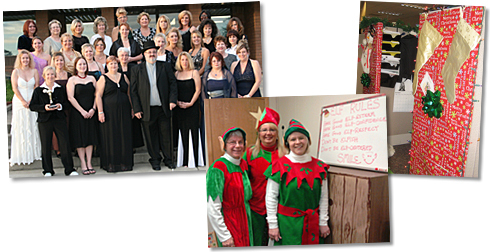 Each day featured a different theme with coordinating decorations, food and activities. Many guests were also brought in to entertain and amaze the team. Mondays theme was farmyard fun. The office was decorated with down home farm flavor and each associate fit right in with the cowboy hat and bandanna provided. But no farm would be complete without animals so Estep brought in a petting zoo complete with alpaca, sheep, cows, a rooster, and more. Tuesdays theme was magic. The office was decorated in black and silver with giant playing cards and top hats. To add to the excitement, a professional magician performed for the team. Wednesdays theme was camping. Once again, the office was decorated appropriately with a wall-sized poster depicting fall foliage, a campfire complete with tissue-paper flames, and a tent. The team enjoyed breakfast and lunch at their campsite as well as a little friendly competition to see who could pitch a tent, climb inside, and zip the flap the fastest. Team members then moved outside to test their skills on a giant inflatable rock-climbing wall. Thursdays theme honored Esteps Georgia home. The office decorations were inspired by Georgia icons and included a representation of the Chatahoochee River running right through the department. An arts and crafts activity was the highlight of the day as a local paint-your-own pottery studio came to the office. Associates decorated mugs, which were then fired at the studio and returned to Estep. Fridays theme was the Olympics. Olympic rings, glowing torches and shiny medals decorated the department. Associates competed in a range of relay races and other events to see who would bring home the gold, silver and bronze. The customer support team at Network Communications Inc. was hard at work planning for Customer Service Week since the beginning of the year. After all, a companywide celebration for 600 takes an enormous amount of planning and coordination. And while the celebration is on a large scale, many of the elements can be incorporated into a celebration of any size. The festivities start the Friday before Customer Service Week when members of the customer support staff visit all employees to deliver goodie bags. The bags contain an agenda for the week, puzzles and games such as word finds and crosswords, and a few sweet treats. During the week there are three catered celebrations for the entire staff of 600: a Monday morning kick-off breakfast, a Wednesday luncheon, and a Friday afternoon Closing Ceremony complete with an assortment of tempting desserts. Throughout the week, the entire company is invited to try their skill at a wide range of puzzles and games where participants are awarded raffle tickets. Then at the end of the week, tickets are drawn and prizes are awarded. Participation in all activities is high, because there are some very exciting prizes in the raffle. For example, last years prizes included iPods and other consumer electronics. Dont have the budget for big-ticket gifts? Russell Schuster, Customer Service Week Chairperson, tells us that many of the prizes are actually vendor gifts. So if your company policy restricts employees from accepting vendor gifts, why not collect them for your own Customer Service Week raffle? Finally, the highlight of the celebration is a fully costumed movie staring the NCI customer support managers. The movie was built around the official Customer Service Week theme, Building Bridges to Customers, and featured a team of cavemen and women building a bridge which featured the support staff as the columns. Seven screenings throughout the week, including one evening screening for the night shift, ensured that everyone had a chance to see the movie and to enjoy some traditional movie-time treats. It is always wonderful to see the creative activities that people develop based on the Customer Service Week theme. The Spirit of Service theme inspired the team at Delta Dental of New Jersey to show their spirit with a companywide luncheon and pep rally. 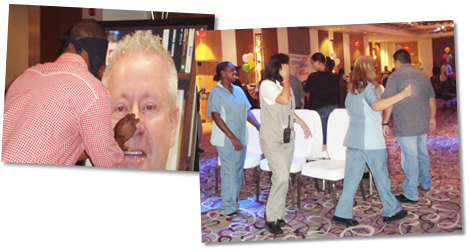 Delta Dental celebrated with a wide range of activities each day all leading up to the luncheon and pep rally on Friday. The entire company was split into teams of roughly 20 people each. Smaller departments joined together and larger departments were broken down into smaller teams. Each team was asked to create a cheer and to decorate a rolling office chair for their float in the pep rally. While the event sparked a lot of creativity and spirit, perhaps most important of all was that everyone came away with a new appreciation of their friends and colleagues. 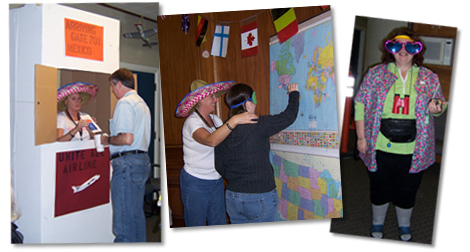 Teambuilding games and exercises of all types abound during Customer Service Week. One exciting example comes to us from the Information Services Department at the Cobb County Government in Marietta, GA. The TV show features 11 teams of two racing around the world to win a cash prize of one million dollars. The teams compete in 13 legs traveling all over the world. In most legs the last team to arrive at the pit stop is eliminated. In Marietta, GA, teams traveled through the office. Each day, they were given a clue that described the location of the first pit stop. When all teams arrived at the pit stop, they competed to complete a task. The last team to complete the task was eliminated from the race. Each challenge took just 10 to 15 minutes and each person on the team was required to participate. Pit Stop #3 Clue. You will now make a visit to the place where the Great Oz resides. There you will find task #3. Task #3. The task is to eat the collard green pie. The last team to finish the pie will be eliminated from the race. If your team completes this task successfully you will be given the next clue. Pit Stop #4 Clue. Navigate your way to this office. This is where very few Information Services staff visit, but they support the entire countys needs for all geographic locations. There you will find task #4. Task #4. The task is to complete the crossword puzzle provided within 10 minutes. If you do not complete the crossword puzzle within 10 minutes your team will be eliminated from the race. If your team completes this task successfully you will be given the next clue. Pit Stop #5 Clue. Customer service is defined in this area. This area handles all your technical support needs. There you will complete the final task and the winning team will be announced! Task #5. Today your team will answer some tough questions. Pick a captain and when the question is asked talk among your group and come up with the correct answer — hit the bell and you will be given a chance to answer. If you get the answer wrong — two points will go to the opposing team and they will get the opportunity to answer the question. The team to get 100 points first wins the Amazing Race. Additional popular game show activities include Fear Factor, Jeopardy!, Cash Cab, and Survivor. For Valerie Johnsons first Customer Service Week celebration, her goal was to do it all! To accomplish everything she had in mind, Valerie dedicated a day to each of her main goals — thanking customers, thanking the people who support customer service, increasing awareness of the work customer service does, building bonds companywide, and showing her reps how much she values them. Each day was filled with activities, but the day Valerie recognized her own team was especially exciting. Reps arrived on Friday morning to find that their department had been decorated and a bag filled with stress relief goodies had been placed on each desk. But that was just the beginning. Over the course of the day, at roughly one hour intervals, Valerie announced a new teambuilding activity. Many came from the CSWeek.com website and email bulletins. The highlight of the day, however, was lunch. While in-house lunches can be routine, this was anything but. The table was set with linen, china and crystal and served by Valerie, who donned a waitress uniform for the event. And because some reps had to be on the phones during lunch, she provided take-out containers so that everyone could enjoy the feast. 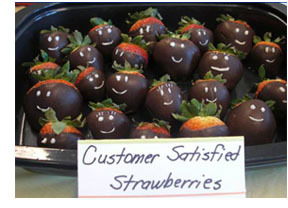 It was attention to details like this that made this first Customer Service Week celebration such a success. 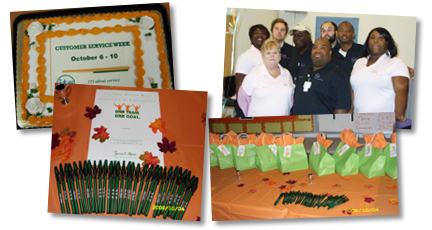 At Masterfoods USA, the Customer Service Week celebration involves 60 customer care representatives and over 400 associates. It was a full week of events such as lunch and learns, department open houses, appreciation breakfasts, and more. Manager Yvette Miller shared details of some of Masterfoods most popular activities along with a great idea for keeping everyone (all 400+ of them) involved. It all started with Recognition Day on Monday. The staff was greeted at the front of the building and invited to the Customer Care Open House where they could learn about the departments work, spin the trivia wheel and enter a raffle. Later in the day, the entire company gathered and each department was recognized for their efforts. Following the company-wide recognition ceremony, each group returned to their department with cake or other treats to share as a team. The video/photography team was on hand all week documenting the many events. Special care was taken to include each activity and department. Then on Friday during the closing ceremonies, a six-minute video was shown. Photos of the week were also posted at the companys website. To ensure maximum participation, each employee received a passport. As they traveled from one activity to another, their passports were stamped. If employees attended a certain number of events, they were eligible to enter a special prize raffle. While the weeklong celebration at Conair was filled with fun and festivities, what really stands out are this teams charitable efforts. Each day was celebrated with a different theme such as red, white and blue day and with games, puzzles and surprise gifts each morning. But as Ruthann Nuzzo says, We always try to do something serious each year. In 2005, the team raised money, which was donated to the Red Cross to support the Hurricane Katrina relief effort. In 2006, they raised money to support breast cancer research. The American Cancer Society holds its annual Making Strides Against Breast Cancer walk in many areas in October. So it was fitting that one of the teams theme days was Breast Cancer Awareness Day. Team members dressed in pink, the decorations were pink and all the snacks were healthy. Each day the team also held a 50-50 raffle. The money raised was used to sponsor team members who participated in the Making Strides walk. If youd like to learn more about Making Strides Against Breast Cancer, please visit the website at makingstrides.acsevents.org. Oh, and if youre wondering about the 50-50, its a raffle in which 50% of the money raised is donated and 50% is given to the raffle winner. Its a great way to have a raffle if you dont have a big prize. Manager Janine Tracy wanted to show her reps just how important their work was to management consulting firm Runzheimer International so she rolled out the red carpet, literally. The excitement started when reps were asked to come to work in their best clothes. At 11:30 they gathered in the building lobby for a group photograph. But the photograph was simply a distraction to get everyone in the lobby so that managers could unroll a red carpet leading from the front door to a waiting limo. Senior managers were on-hand to hold the doors and help all 32 team members into the limo as their coworkers looked on from their office windows above. After a brief ride, the limo pulled up to a downtown restaurant where the street had been cleared to allow the limo enough room to park. Guest speakers, gifts and lots of laughter highlighted the buffet lunch. Then, upon returning to the office, each rep was greeted with a voice mail message from the company president thanking them for the work they do. To keep the memories of this wonderful day alive each rep received a photograph of the entire team in front of their limo. Finally, two special touches ensure that everyone in the company knows about the important work of customer service and had an opportunity to acknowledge the team. And second, a program was created for the event, which included accolades from co-workers about the wonderful work of the customer support team. To view a copy of the recognition program, click here.